I did something new today: I handed out chocolate bars to strangers. And it felt really good. My confidence is obviously growing! OK, it helped that I wasn’t alone. My lovely mum was with me, and also the lovely Sarah Julian a presenter from BBC Radio Nottingham. I’d been invited into the studio to talk about my kindness acts in a pre-recorded interview, and then go out to perform some kindness acts with the presenter. I was pretty nervous going into the studio, but focused on my mission: to spread the kindness message. Sarah and I had a great chat, and although it was really cringey to hear myself on the radio the next day, I’m happy that I didn’t make a complete fool of myself (well, I hope I didn’t anyway!). And it was so much fun going out with Sarah to do the kindness acts. We drove to the nearby retail park, which houses one of my fave shops: Hobbycraft – I asked mum and Sarah to keep in me out of there, by force if necessary! 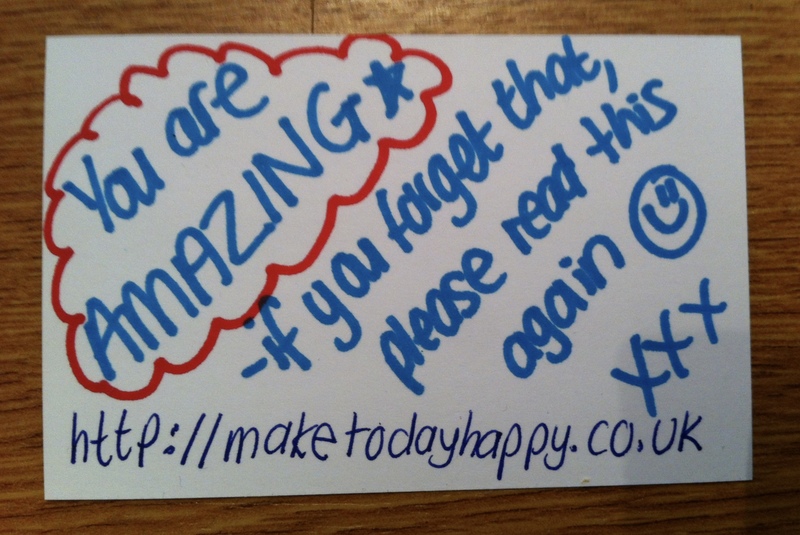 My mission was to hand out some chocolate bars to busy shoppers, each with one of my kindness cards attached with the message: You are AMAZING. If you forget that, please read this again. After I’d approached the unsuspecting shoppers, Sarah asked them a few questions about the experience. A couple of people ran away – Sarah kindly pointing out it was probably due to the big fluffy microphone she was holding – most were surprised, and everyone smiled. It was brilliant to see Sarah join in and hand out a couple of choccie bars too. And as we drove away in high spirits, I was happy to hear she’d had fun too. I can honestly say that from my experience, the giver benefits as much as the receiver. This is what it’s all about: making someone smile. I am so touched that this lovely couple made the effort to get in touch. And that they were kind enough to want to pay it forward is the icing on the cake, with the cherry on top! So with this in mind, my happy for today is being kind by handing out bars of chocolate, face-to-face! ps if you fancy a listen…. It’s been a long time since I’ve made any raw treats. My last batch ran out a few weeks ago, and I’ve been dipping into the biscuit tin and chocolate box way too much. I need to replenish my treat stash quickly in order to have them on hand for when I have a sweet craving. It’s time to say Bye Bye biscuit tin and beloved Galaxy Minstrels, and Hello Helen’s Raw Chocolate Bliss Balls. Bliss Balls were actually my first step into the wonderful world of home-made raw treats. After realising that sugar was not my friend, I’ve been making variations of these for a few years now to satisfy my sweet tooth. And it works. And they’re delicious. And nutritious. My fave recipe combines mixed nuts and seeds, raw cacao, vanilla powder, cinnamon, chia seeds, super-greens powder, dates, and rice syrup, with coconut oil for binding, and desiccated coconut for rolling in. Did I mention they are absolutely yummy? I enjoy spreading the no-sugar love too by making them for dinner parties, and giving as gifts for friends and family. I’m often asked for the recipe which is brilliant; changing the world one bliss ball at a time! Variety is always welcome so today I wanted to make two flavours. I decided to try out a new recipe I’ve found for Sesame Power Balls. With tahini, ground almonds, almond butter, coconut, seeds, vanilla powder and rice syrup, it sounded like a recipe made in raw food heaven. And it was. I wanted to practice mindfulness as I made my treats. So I focused on being present, mindful and aware, as opposed to stressed, distracted and overwhelmed. I stayed alert to my senses: the texture and smell of my yummy ingredients; watching how they bind together in my food processor; taste testing for sweetness; and the feel of rolling the mixture into balls in the palm of my hand. I was also mindful of my breath, keeping it slow and steady throughout. And if my mind wandered off, I gently invited it back to the task at hand. Now I have 20 little balls of deliciousness packed away in the freezer to enjoy over the next few weeks. I usually find that one is enough to satisfy my sweet tooth, although I have been known to sneak another one or two. But they’re actually quite filling and one is usually enough. Honest. So with this in mind, my happy for today is being mindful in the kitchen when making my raw chocolate treats. I’ve wanted to be part of the kindness movement ever since reading Danny Wallace’s brilliantly funny ‘Join Me’ book. With so many kindness organisations such as the Wake Up Project and the Random Acts of Kindness foundation encouraging people to spread happiness by being kind, I feel it’s time I did something about it. 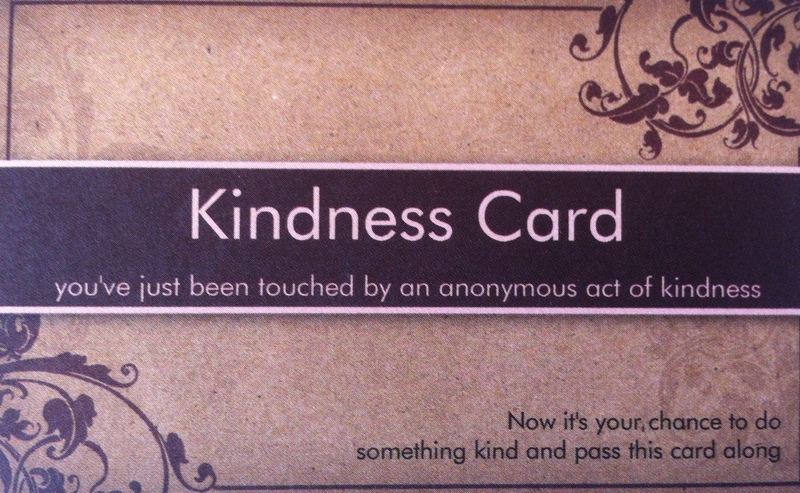 I love the idea of Kindness Cards, which involve doing a kindness act anonymously and leaving a kindness card. While this is enough in itself, it may hopefully encourage others to do an act of kindness, creating a ripple effect. The Sydney-based Wake Up Project offer a handful of gorgeous Kindness Cards, but understandably don’t post internationally. So I decided to try and make my own. While in the midst of doing a pretty embarrassing botch job on my macbook (technology is not my forte), I received an email from Vista Print offering me 100 business cards for free. Perfect timing I thought. So I decided to make use of this gift of generosity and make my own kindness cards. As my circumstances are limited – both health wise and financially – I need to get creative with what I can do. I’m sure I’ll be writing about my kindness acts as I go along. Keen to start today, I bought a couple of chocolate bars, stapled a Kindness Card onto each wrapper, and wrote: ‘Please enjoy! ’ on the back to hopefully entice the finder to take it and enjoy it, and not be suspicious of it! I excitedly left my first act of kindness on the shelf at the library, hoping a bookworm browsing the shelves will stumble upon my choccie gift and enjoy it. The second I left on the bus, for the next passenger to enjoy. Numerous research has shown how doing an act of kindness for somebody also has an incredible effect on the giver as well as the receiver. And it’s true. I feel happy and uplifted that my kindness acts have hopefully made two people smile today – and the thought that they may even feel inspired to ‘pass it on’ is the icing on the cake. So with that in mind, my happy for today to being kind by leaving chocolate bars for strangers to find.